Google released the Android 8.1 Oreo update back in December last year and since then the company has been rolling out cool new features to the OS with subsequent updates. Now, according to a recent tweet from the official Android account, the company has announced a new feature. The latest addition to Android 8.1 Oreo comes in the form of a WiFi speed indicator which will display the speed of open networks in the user’s vicinity. The WiFi settings menu now displays one of four speed labels- Very Fast, Fast, OK, and Slow- which will help users decide which open network they should connect to. As per Google, the difference between Very Fast and Fast networks is that with Very Fast networks users will be able to stream “very high-quality videos”, while the Fast networks will stream most other videos. OK networks will be good enough for light web browsing, social media, and Spotify streaming. While Slow networks are not even worth connecting to unless it’s an emergency. The new feature will only work on public WiFi networks which aren’t protected by passwords. Private WiFi networks which require passwords won’t display any speed data as Google won’t be able to test them without proper authentication. 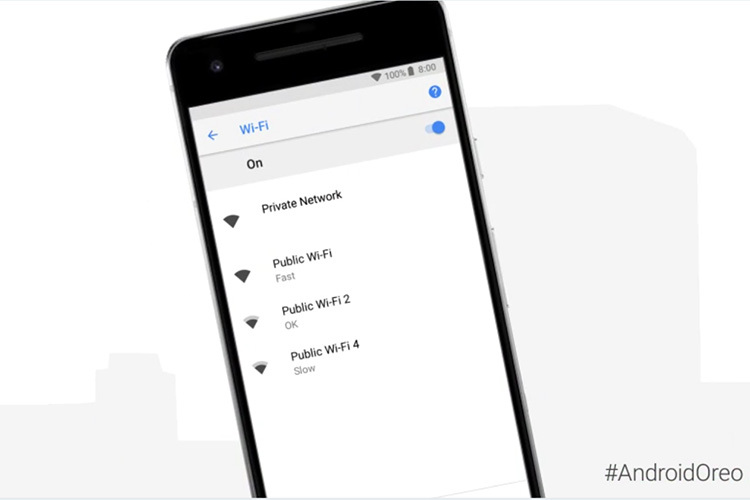 The company claims that network administrators will be able to opt out of Android’s WiFi Assistant showing speed information. Previous additions to Android 8.1 Oreo include alerts for battery consumption, support for the Visual Core chip on Pixel 2 devices, minor interface optimizations, TensorFlow Lite optimizations, performance optimizations for devices with 1GB RAM, a new calendar widget, a slightly redesigned central shortcut, and a highlighted “Gestures” menu in the system settings. Other minor changes include a battery level indicator for connected Bluetooth devices, improvements to the autofill system, a remodeled power off/restart menu, and a few updates to the emoji design.